Thanks to one of the blog readers, Jeffrey Meyerson, for steering me to Bill Pronzini's western, Give-a-Damn Jones. Artemis Jones, or Give-a-Damn Jones, is the perfect example of the American paladin, a knight of the road who rides in and cleans up a town. In this case, Jones won't admit he's on the side of good, but those who know him tell of his legend. Owen Hazard was twenty-four when he met Jones for the first time, but he'd heard story of the man who was only ten years older than Hazard at the time. Owen Hazard is only the first person to tell of his encounter with the man. Hazard looks up to Jones because they share a profession. They're both itinerant typographers, men with restless souls who traveled the country taking jobs at newspapers, and then moving on when they become restless again. Hazard tells of meeting Jones in Butte, Montana, at that time one of the wildest towns of the west. After Jones wins a horse in a poker game, he sets out across the territory on horseback, instead of by railroad as he usually traveled. Several people tell of Jones' arrival in a troubled town, Box Elder, in Montana. One is a ranch hand for a cattle rancher who is still powerful in the county, although farmers are moving in and they're fighting ranchers for land. A teenager, son of the newspaper owner, recognizes Jones' name, and hopes his father will hire him. 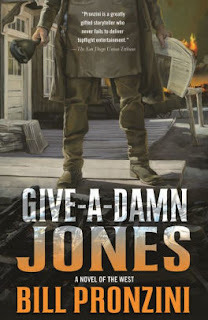 Give-a-Damn Jones never tells the story of the man wrongly convicted who served time for five years, his love for the rancher's daughter, the man who may have lied to convict him. But bartenders and shopkeepers and the newspaper owner and the sheriff recognize the trouble in their town, and the need to clean it up. And, by the time Owen Hazard runs into Jones again, he's heard the stories out of Box Elder. Give-a-Damn Jones doesn't care to be called that, but he was given that nickname because of the stories. "You're always willing to help folks in need or trouble. That you can't abide injustice, can't step aside from it no matter what." Bill Pronzini is an acknowledged master of the turn of phrase. Mystery Writers of America named him a Grand Master. But, he's equally adept with a western, just another form of the paladin story. His descriptions of Montana, the wild towns, the landscape, the history behind the towns, is spare but beautiful. He takes readers into the time period and the setting. Give-a-Damn Jones seems to be a simple western. Actually, it's a story of a man who becomes a legend in his time. Give-a-Damn Jones by Bill Pronzini. Tom Doherty Associates, 2018. ISBN 9780765394392 (hardcover), 255p. So glad you liked it, Lesa. I am halfway through it and will finish it today. I've been a fan of Bill's since the '70s. I read this a couple of weeks ago and thought it was just OK. Bill Pronzini’s books have always been hit or miss for me. It was a nice departure for me, Jeff. Thanks for the heads up. It was a nice change for me, Sandy, as I told Bill. I need a break from mysteries once in a while. Thanks for the recommendation. I've just put it on hold.